WINTER IS COMING (I’ve done that twice in my posts now. Oops, but not really). Well, technically fall is here and that means it is time to change our makeup routine and what products we use. During the summer there is nothing better than a dewy, glowy look, but during the fall and winter seasons I love wearing more matte makeup looks. 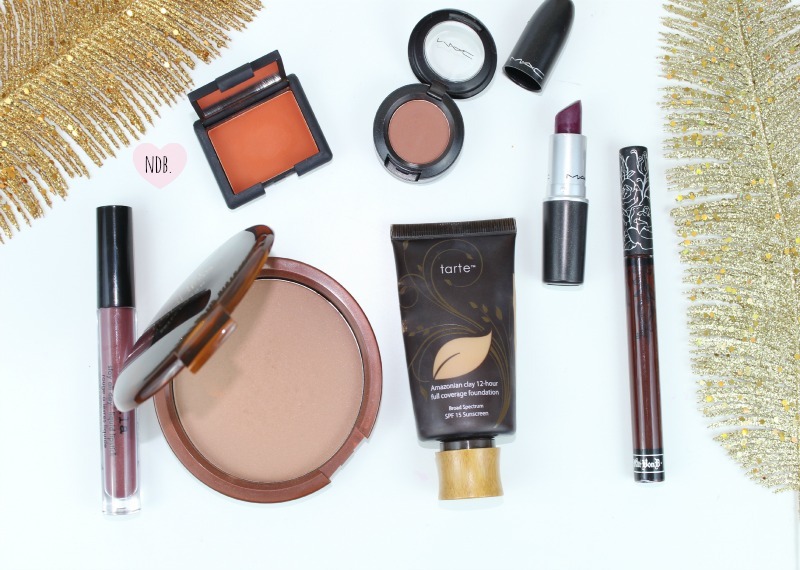 So, since it is time to go back to matte, here are some basic– basic, but not basic, if you catch my drift– beauty products that are great staples to have in your fall and winter makeup collections. Of course, who am I kidding, these are not the only products I use when doing my makeup, but these are a great building block. You know, the basics. Okay, enough with the “basic” and on with why you’re probably here. Amazonian Clay Foundation | A nice full coverage foundation is great for the Fall and Winter seasons because it smooths out your skin and makes it look flawless. Another plus is since you won’t be sweating as much, it will last on your skin a lot longer. This one by Tarte is nice because it isn’t heavy on the skin and lasts all day. It also has a nice velvety matte finish so it isn’t super drying and still looks like skin. 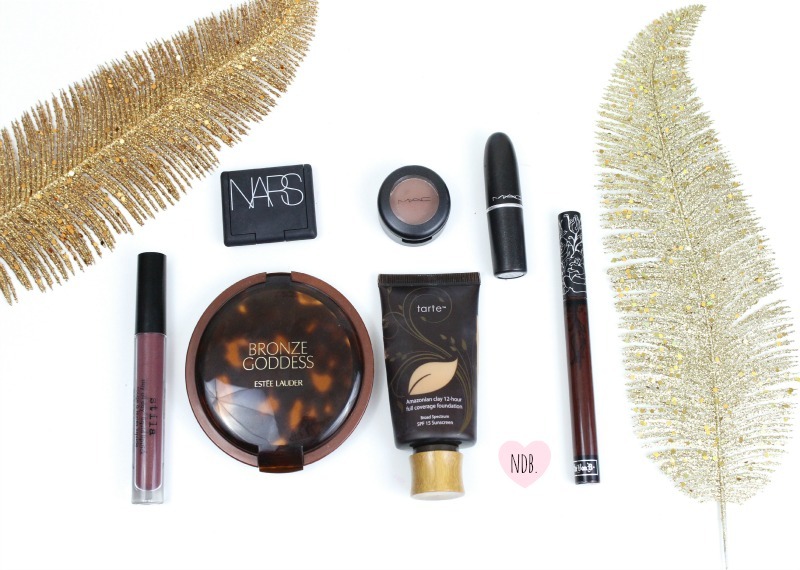 Bronze Goddess Bronzer | We all know I am a huge fan of this bronzer, and I love using it especially in the winter months. It has a slight shimmer running through it, but it isn’t visible on the skin at all so I consider this to be a matte bronzer. It just leaves your skin looking very sun kissed and it doesn’t look fake at all. Plus, you get so much product! Persia Eyeshadow | This is another product that I have mentioned before. I did a whole review on it because it has stolen my heart. Although this eyeshadow is pricey, the color is something that I have not come across before, and it looks gorgeous. It really warms up any eyeshadow look and blends flawlessly. Just a reminder though, this can be a bit harsh so use it sparingly. Brown Script Eyeshadow | As much as I love Soft Brown, which is also by MAC, this eyeshadow is one that I love more in the colder months because it is a richer brown color. It is great as a crease shade, but I also use this all over the lid then dab a little bit of sparkly eyeshadow right in the center for a simple, but beautiful look. Rebel | I don’t think there is a beauty junkie on this planet who hasn’t heard about this lipstick by MAC because it is just so popular, especially during the fall and winter. It is a deep plum/ fuchsia shade that glides on smoothly. Although this technically isn’t matte, since it has a satin finish, it isn’t really glossy. It looks like a matte lipstick, just not as drying on the lips as some can be, and there is no shimmer or anything running through this shade.If you don’t feel like spending $16 on this baby, you are in luck because there is actually a much cheaper dupe! Vampira | I have only owned one other Kat Von D liquid lipstick, but this one is hands down my favorite. The moment I saw this from across Sephora, it caught my eye. Okay, okay, I didn’t spot it from across the store, but it definitely did catch my eye as I was browsing the Kat Von D aisle. Of course, you would expect her brand to be highly pigmented, and it is! This looks like a lip gloss, and applies like a lip gloss, but it is definitely not a lip gloss; it is a liquid lipstick. It has a very creamy and opaque consistency so once you apply this, it dries matte onto your lips and won’t budge for a few hours. It even withstands a night out on the town as you sip on some drinks. It is basically the color you would think a vampira (aka a woman vampire) would wear on her lips: a dark reddish burgundy shade. I’m warning you now, this shade is very bold so it is not for the faint of heart. Still, I love these liquid lipsticks so much that I’ll probably pick up a few more shades and dedicate a whole post to them. Amore | Another liquid lipstick. Yeah, you guessed it: these are my current obsession. I have two other shades from the Stila liquid lipstick line, Patina and Bellissima, but this one is the newest to my collection. It is a browny plum shade that looks amazing and it is a more wearable shade during the day. I bought this a week ago and have worn it almost every day that I’ve worn makeup, which is most of the week since I currently go to school. Again, I’m lying a little because this particular shade has a some gold sparkle running through it, but once you apply it on to your lips, you would never even know that. So, shh.. just pretend this is fully matte because it most definitely dries to a matte finish. Matte beauty products you need this fall. Have you tried any of these? Do you have any favorite matte beauty products? Let me know in the comments!